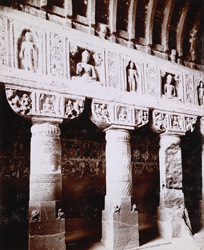 Photograph of the interior of Cave 19 at Ajanta, taken by Deen Dayal in the 1900s. Cave 19 is a very elaborate rock-cut chaitya hall from the late 5th century. The external facade has a large horseshoe-arched window flanked by figures of yakshas and Buddhas carved in relief. A columned portico precedes the entrance and leads to the interior hall as seen in this view, which is divided in three naves by two rows of elaborately decorated columns. The capitals are carved with Buddha figures, flying couples, hermits and musicians. The panels above depict Buddhas surrounded by bands of scrollwork. At the end of the apse there is a Buddha image in a niche on the front of the votive stupa. The cave has preserved some of its wall paintings.